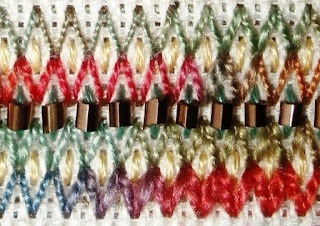 The TAST stitch for week 48 is arrowhead stitch. I stitched another 2 x 2 inch sampler on my Aida. First I made stacked rows of arrowhead stitches with different threads. From top to bottom: 2 threads of stranded floss, perle 8, Stef Francis spun silk with flames, 4 threads of stranded silk, perle 12 and perle 5. 2 threads of stranded floss. Four rows of arrowhead stitches with Stef Francis spun silk with flames. I decorated it with small bugle beads and stitched straight stitches inside both outside rows with stranded silk. I found this threaded arrowhead stitch in module 5 of Sharon’s stitch files. It’s done in perle 5. Take a closer look at my complete sampler here. Die met de kralen erin vind ik heel bijzonder. Beautiful- especially the colours are great! Perfect samples -as you always make them. I thought this stitch would always have a sharp look but by blending in Detatched Chain stitches or thread them the get a much softer look. The Arrowhead stitch also changes a lot with the angle; I think my favourite is the sharp one worked with bugle beads. It is always a pleasure to look at work. you always manage to push the stitch further and give inspiration to the rest of us, agree with Queenie re the softness.